Deja Vu - Cup & Runners Up! Following the successful 1986 season Colin Pratt had to once again break up the team to fit in with the rules and regulations about the points limit. Colin was getting used to it now! Phil Collins decided to try his luck in California, Steve Bastable who was on loan from Coventry was sold to Bradford. Simon Cross was talked into staying with the Heathens despite threatening to leave speedway for grasstrack and longtrack. The base was built around Erik Gundersen, Jan O'Pedersen and Simon Cross, taking up around 29 points of his allocation. Now he had to find four more riders who's combined average was less than 19 points! 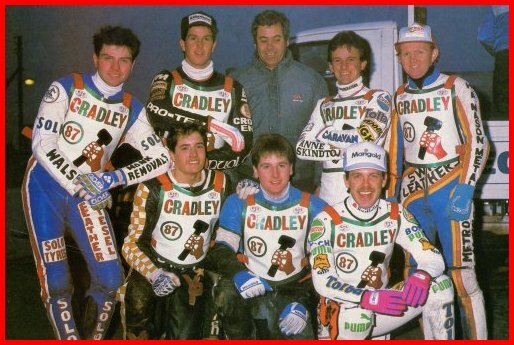 He recalled Alan Grahame for his testimonial year with the Heathens and signed David Walsh on loan from Sheffield and Dean Barker from Eastbourne. To complete the team he retained junior Paul Fry. front row - Dean Barker, Paul Fry, Erik Gundersen. Against the odds they continued to do well until weakness at reserve was exposed by Coventry, Reading and Oxford in successive matches.Danish youngster Jan Jakobsen was brought over just before Eastbourne recalled Dean Barker. This fitted well as Alan Grahame was now back at reserve where he proved to be the trump card on several occasions. Coventry put an end to any hopes the Cradley had of winning the League and also beat the Heathens home and away in the League Cup, but in the K.O Cup and the Midland Cup it was a different story with a draw at Brandon thanks to 12 paid 15 from David Walsh in the Midland Cup. 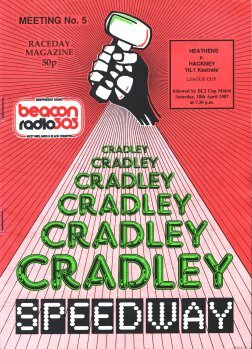 Cradley added the British Trophy to the KO and Midland Cups and the Dudley Wolves Trophy. Individually Simon Cross, Jan O' Pedersen and Erik Gundersen all reached the World Final with Erik clinching the runners up spot. Jan O held the Golden Helmet defeating Simon Wigg at Dudley Wood in April and successfully defended it two days later against Steve Regeling but later that day he was injured at Coventry and as he was unable to defend his title it passed on to his cousin John Jorginsen by default. Erik was unbeatable in the Golden Hammer winning again to become the only rider to win it twice - Kenny Carter was the other to win it twice. Simon Cross 13, Dave Walsh 10, Jan O.Pedersen 10. Cradley started the season by losing both legs of the Premiership to Oxford 82-72 on aggregate. Again we hosted an International Test Match - this time England - Denmark drew 54-54. The Golden Hammer was retained by Erik Gundersen the first rider to win it in successive years. The Final between Coventry and Belle Vue ended all square after two legs 78-78.